When it comes to living a long life “the recipe is just patience”. This is according to Mbah Gotho, the Indonesian man who claims to be the oldest person in the world , at 146 years years old. It may not be quite as easy as he makes out. According to the World Health Organization , global life expectancy has only improved by around three years since 1950. Between 2000 and 2015, average life expectancy jumped by five years to 71.4 years, according to the WHO. In Africa, meanwhile, it increased by over nine years. Large variations remain, both geographically and between the sexes. There are also different factors, to do with lifestyle and environment, that can help determine how long you live. 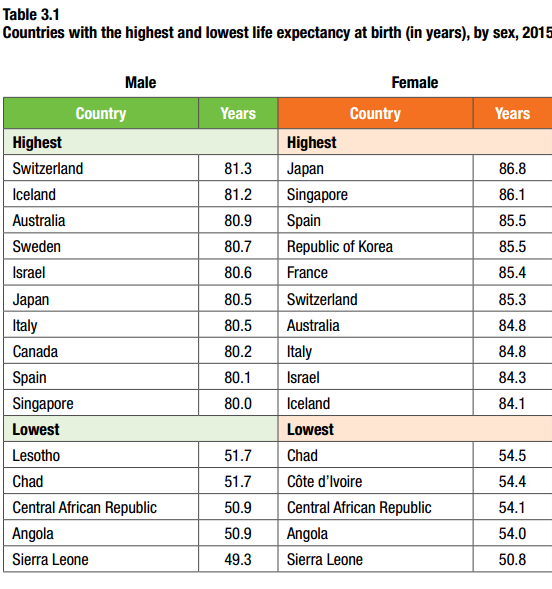 There's a gap of more than 33 years between the country with the lowest life expectancy, Sierra Leone, and Japan, where citizens have a reputation for longevity. This is despite the enormous progress made in Africa over the past 15 years to overcome the decimating impact of HIV in the 1990s. Women generally live longer than men. This may be largely due to genetic differences , but it's also down to the country you live in. Japanese women can expect to live the longest, with an average lifespan of 86.8 years, while Switzerland enjoys the longest average survival for men, at 81.3 years. The biggest difference between the sexes – 11.6 years – was recorded in Russia, followed by Belarus and Lithuania. Also in the top 10 are Ukraine, Latvia and Estonia. An article by the BBC attributes this to the fact that male citizens in these countries drink and smoke more heavily. 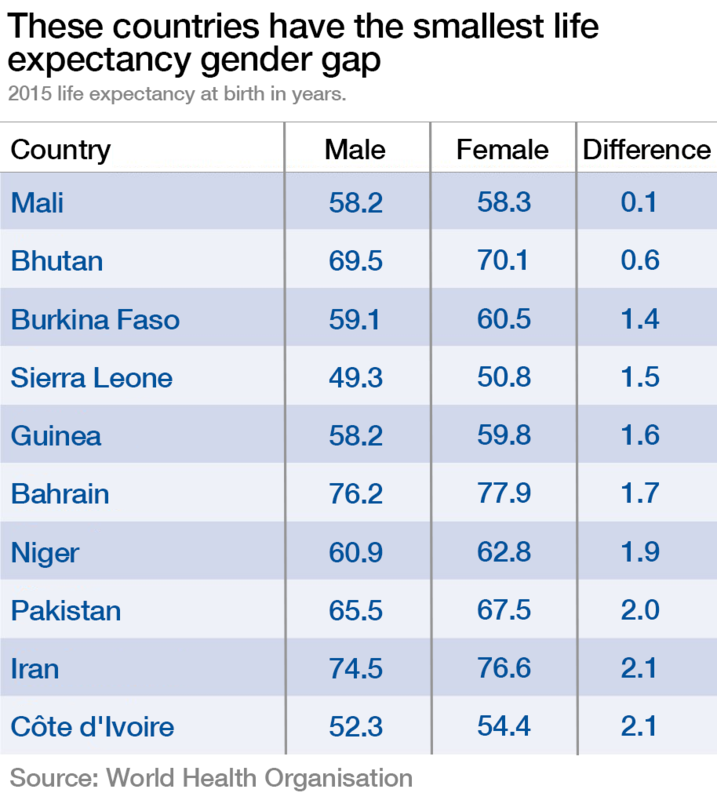 Mali has the narrowest gender gap, according to the WHO, but a low average life expectancy: people in the country generally live for just over 58 years. The ageing process also varies according to your genes. In the United States, a recent study by the Centers for Disease Control and Prevention (CDC) found that Latin Americans live longer than Caucasians, despite having higher rates of diabetes and other diseases. The study found that this was due to a slower ageing process at a molecular level. 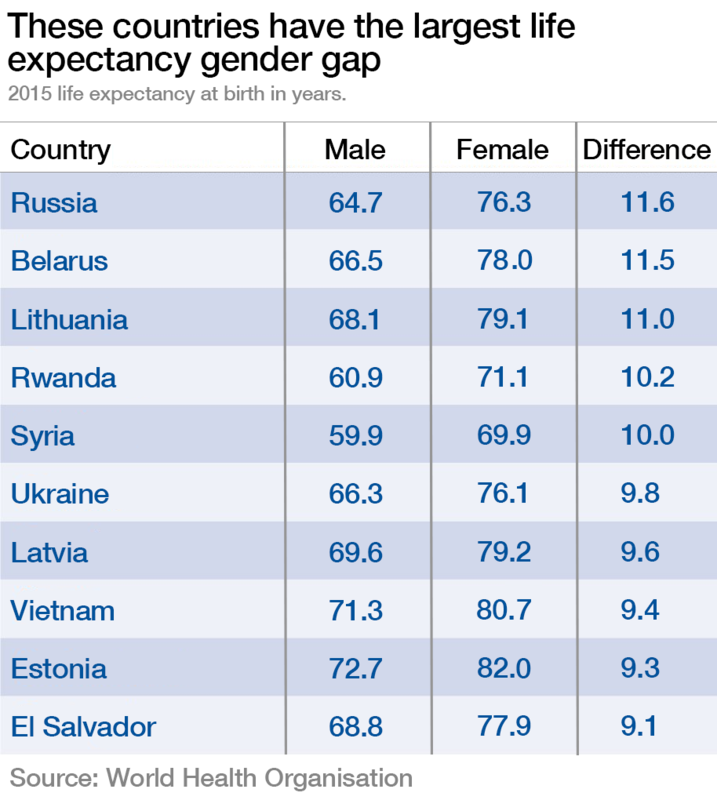 Obviously, aspects such as socio-economic differences and the state of healthcare in a country play an important part in extending life expectancy, as does exercise and diet. A new study has shown that Japan’s longevity is down to the nation’s healthy diet : low in saturated fats, processed foods and high in carbohydrates from rice and vegetables. What may be harder to understand is the role that having children plays in a person's life expectancy. And not just children, but male offspring in particular. There is now scientific evidence that women who have sons can live slightly shorter lives than those who have daughters. A Scandinavian study, reported in Scientific American in 2013 , showed that a woman’s risk of death increased by 7% per year for each son born. The study was based on birth and death records from pre-industrial Scandinavia. This may be due to boys taking a heavier toll on their mothers’ bodies because they generally weigh more than girls at birth. Mums may also need more energy to produce sufficient milk for boys, though studies have delivered inconsistent results. There are two main take-aways from the above charts. From a policy-making perspective, they highlight that there is still a lot of work to do en route to the United Nation’s Sustainable Development Goals, of which a number relate to guaranteeing healthy lives and well-being. And while you cannot control your genetics and don’t get a choice in your children’s gender, a large share of your life expectancy is down to the choices you make – exercise, diet and lifestyle habits.